This pdf clocks in at 6 pages, 1/2 page front cover, 1.5 pages of SRD, leaving us with ~4 pages of content, so let’s take a look! -Disciple of Cavalry: Use your or your mount’s Str-mod for atk and damage; change as a free action. OUCH. This can be pretty powerful. -Improved Trick Riding: Unless otherwise desired, treat all Guide with knees, Stay in Saddle, Cover, Fast Mount/Dismount-checks as taking 10. Damn cool since it eliminates unpleasant failures. -Live in the Saddle: Substitute Ride skill modifiers for Wis, Int or Cha modifier for concentration checks in the saddle; sleep in the saddle for DC 15 Ride-checks. This is rather strong, considering how much higher a Ride skill will ultimately be. Not a fan. -Master of Cavalry: Divide your inflicted damage freely in a 10-ft burst around the point of impact while making a mounted charge, minimum 1 damage per eligible target. Interesting. There also are two new traits – one for determining breeds and health and one to negate penalties resulting from cultural discrepancies – I like both for their narrative potential. The Horse Lord PrC nets d8, full BAB-progression with mounted, 3/4 BAB-progression while not mounted and requires a whopping 10 ranks, meaning it’s a mid- to high-level goal. The PrC nets 1/2 Fort and Ref-save progression, 4+Int skills per level and proficiency in simple and martial weapons as well as light and medium armor and shields. I do assume that the mounted BAB is also used for the purpose of combat maneuver calculation while in the saddle, though an explicit note would have been appreciated here. At first level, all Ride-checks may be treated as taking 10; 2nd level nets aforementioned Disciple of Cavalry feat and levels 3, 6 and 9 provide a fighter bonus feat. 3rd level horse lords may issue simple commands, horse whisperer style, to their own horses (and others) via Handle Animal and 4th level increases the number of tricks a horse can be taught by 3, with 11 special tricks (duplicating, for the most part, feats like Iron Will or Weapon Finesse) being provided in a brief table as unique tricks, 2 of which are counted as one trick – including DCs and training time. At 5th level, horse lords no longer suffer penalties to ranged attacks while in the saddle, even when running only a -2. 7th level provides Master of Cavalry as a bonus feat and 8th level Spirited Charge (triple/quadruple damage if the horse lord already has the feat). As a capstone, we get a +5 dodge bonus for horse lord and mount while engaged in mounted combat. Editing and formatting are very good, I noticed no significant issues. Layout adheres to a relatively printer-friendly 2-column full-color standard and the pdf has a nice artwork and bookmarks – in spite of its brevity. Additionally, we get a more printer-friendly version – kudos! 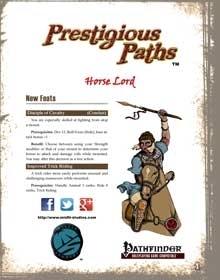 Steven Trustrum’s Horse Lord is a humble little PrC that does pretty much what’s advertized on the cover: provide a relatively nice mounted PrC to represent nomads or cavalry specialists. There is nothing per se wrong with this PrC – but it does sport some rough edges: The new Disciple of Cavalry-feat, for example, has a pretty low entry-barrier…and the PrC explicitly does not grant any benefits to PCs already having the feat, resulting in a potentially dead level, with the same thing happening for Master of Cavalry at 7th level. I don’t get this – either the prereqs of the feats are too low or there should be something for specialists already having them. Basically, this introduces per se interesting new material, but penalizes players trying their best to use all of it at peak efficiency – and Spirited Charge + Master of Cavalry + Smite/Challenge + Cleave-builds can cut swathes through foes…so yeah, as always with cavalry-specialists, handle with care. 😉 At the same time, this certainly is no bad supplement and the traits themselves are nice, as is the steed-trick array. Still, ultimately, the horse lord PrC does feel like it could have used more unique tricks to set it apart, things that e.g. a mounted paladin or cavalier can’t do. Hence, my final verdict will clock in at 3.5 stars, rounded down to 3 – a solid, if a bit unremarkable PrC-book. You can get this small pdf here on OBS and here on d20pfsrd.com’s shop! Interesting topics, would there be horse care and feeding tips included? being a horse man, its also important to know how to take care of horse. Alas, this small pdf does not cover care and feeding tips.